The following post was written by our guest blogger, Anne Filipic, President, Enroll America. The Affordable Care Act now offers hospitals a new opportunity to connect patients to Medicaid by using presumptive eligibility (PE). For years, many hospitals have been using PE for pregnant women and children, but now, all hospitals that participate in Medicaid can use PE. Presumptive eligibility allows hospitals to immediately enroll patients in Medicaid if it appears they are eligible. It saves hospitals time by creating an expedited pathway to Medicaid enrollment. The hospital only needs to collect a few basic pieces of information from the patient, and then the hospital is quickly able to assess potential eligibility and enroll that person temporarily in Medicaid coverage if it appears he or she is eligible. Presumptive eligibility improves the ease of reimbursement to hospitals and, by maximizing enrollment, lowers uncompensated care costs. It also allows qualifying patients to receive much needed follow-up care, which reduces the likelihood of readmission. It is important for all qualifying patients to pursue ongoing Medicaid coverage and some states may require hospitals to assist these patients with applying for ongoing coverage. 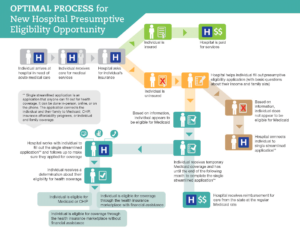 The graphic below shows the ideal process for patients receiving care and connecting to coverage through a hospital that uses PE. Hospital PE is beneficial for hospitals and patients: hospitals are reimbursed for the care they provide and patients are more easily connected to coverage. States across the country are at varying stages of implementing this policy, but each state is required to develop a hospital PE program. Our organization, Enroll America, sees hospital PE as a unique opportunity for hospitals to become involved in connecting patients to health coverage and we are pleased that Soriant Solutions is working with us to highlight this important policy option. As part of Enroll America’s work focused on increasing enrollment in health coverage, we have put together a toolkit designed to help hospital administrators better understand hospital PE and take steps to implement it. To access the toolkit and get additional information, including the current status of hospital PE implementation in your state, go to http://www.enrollamerica.org/toolkits/pe/home.html. 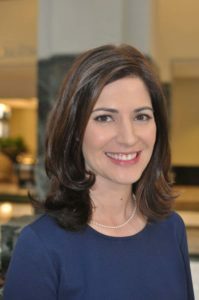 Anne Filipic serves as President of Enroll America, a non-profit organization dedicated to maximizing the number of Americans who enroll in and retain health coverage made available through the Affordable Care Act. Representing the nation’s leading health coverage enrollment organization with a staff of over 230, a coalition of over 2,300 partner organizations, and a network of over 31, 000 volunteers, Ms. Filipic has become a leading voice on the consumer experience and best practices around ACA enrollment and engagement. In addition to Enroll America’s Best Practices Institute technical assistance and tools, like the Presumptive Eligibility Toolkit, Enroll America works with hospital partners to provide enrollment literature for facilities; co-host Enrollment Events; and conduct trainings for hospital personnel to support and augment their efforts to talk about enrollment with consumers/patients. If you’re interested in partnering with Enroll America or learning more about our resources for providers, please email.